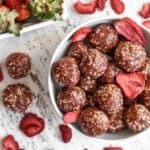 These energy bites are loaded with dried strawberries and collagen for an easy, raw, bite-sized, naturally sweetened snack! No baking required, gluten free, dairy free, refined sugar free. Place parchment paper or a non-stick silicon mat on a baking sheet. Set aside. Make sure your dates are pitted and moist. If needed, soak them in hot water for about 10 minutes to soften them, and then drain them before adding them in the next step. Combine dates and strawberries in a food processor, pulsing until chopped and somewhat combined. Add cashews, collagen, vanilla and salt and pulse until you have a relatively fine crumb that is moist and combined. If it seems too dry, add water (1 tablespoon at a time) and pulse again to combine. You should be able to squeeze the mixture in your fingers and have it all stick together. Use a small cookie scoop or tablespoon to scoop out the mixture and roll them into balls. Place the balls on the prepared baking sheet. Store in an airtight container in the fridge until ready to eat. Enjoy! If desired, you could roll them in desiccated coconut, crushed pistachios, or even freeze dried strawberries (just crush them into a powder in your food processor)!